The Wrestling Insomniac: The Headbangers WWE Team Champions? The Headbangers WWE Team Champions? I pride myself on me wrestling knowledge and considering I was eighteen in 1997 during one of the hottest years in wrestling I can't believe I forgot this but, The Headbangers were the WWE Team Team Champions! I remember them winning the NWA Tag Team Championships and their feud with the Oddities over the Tag Team Champions of the Universe foam belts. But, I have no recollection of them holding the WWE Tag Team gold until listening to a recent episode of Something to Wrestle. 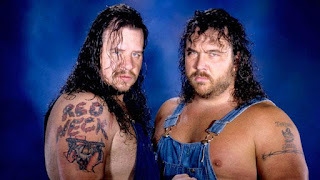 On September 7, 1997 in Louisville, Kentucky at In Your House: Ground Zero the Headbangers won a fatal four way match for the vacant Tag Team Championships. They were the clear underdogs in the match with opponents The Godwinns, The Legion of Doom, and Owen hart & The British Bulldog I'm sure no one expected the Headbangers to win. The months leading up to the PPV the Headbangers were on a tremendous losing streak at house shows and on television primarily against The Godwinn's. After winning the championships they didn't start out well losing to the Godwinn's in three minutes the next night on Raw in a non-title match. On TV they would feud with The Godwinn's and their new manager Cletus, but pick up wins on the house shows first against Rocky Maivia & Kama and later Savio Vega & Miguel Perez Jr.
Their biggest win as champions came on September 20, 1997 in Birmingham, England at the One Night Only PPV where they defeated Savio Vega & Miguel Perez Jr. at 13:34 with the Bombs Away on Perez. Their twenty eight day reign came to end in St. Louis, Missouri at In Your House: Badd Blood on October 5, 1997 when the Godwinn's won the championships when Phinneas pinned Mosh. The Headbangers would beat the Godwinn's in a non-title lumberjack match the next night on Raw, however the Godwinn's would lose the championships to the Legion of Doom October 7th. 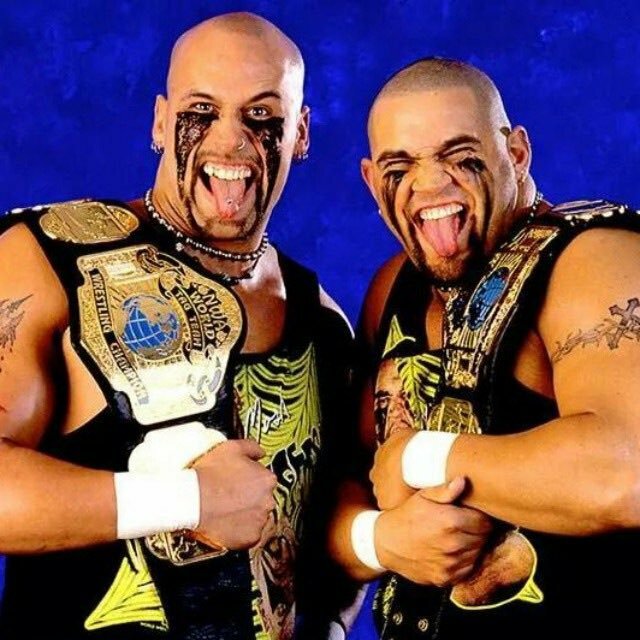 The Headbangers never recaptured the WWE Tag Team championships, however they did win several regional tag team championships over the years. 2019 marks their 25th year teaming together. The Headbangers were in the opening 15 team battle royal that was eventually won by LOD 2000. CCW Tag Team Champions: The Headbangers: Mosh & Thrasher defeated The Prestige: Ryan Waters & Matt Magnum with the Stage Dive on Waters. 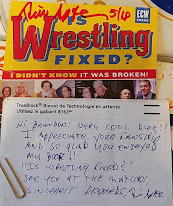 Falls Count Anywhere: “Real Deal” Brandon Locke w/ Adam Barisano pinned “Taskmaster” Kevin Sullivan after the match Sullivan beat up Barisano and then the Headbangers: Mosh & Thrasher attacked Barisano attempting the Stage Dive but Barisano botched it. The Headbangers were supposed to wrestle on Day 3 of the Boston Pro Wrestling Marathon but the promoter cancelled the final day of the show last minute. At both the show in 2012 & 2015 I chatted with them and got some cards signed. They were super cool to talk to and were genuinely nice guys.